The history of Armenians in Iraq is documented since late Babylonian times. The Tigris and Euphrates rivers both have their sources in the Armenian Highland, hence, the land of Iraq and the land of Armenia have always been connected. Today it is estimated that there are around 10,000–15,000 Armenians living in Iraq, with communities in Baghdad, Mosul, Basra, Kirkuk, Baqubah, Dohuk, Zakho and Avzrog. They make up the second largest solely Christian ethnicity in the country, after the indigenous Assyrians. The history of Armenians in Iraq is documented since late Babylonian times. However, the general roots of the contemporary Armenian community in Iraq can be largely traced to Shah Abbas's forced relocation of the Armenians to Iran in 1604, some of whom subsequently moved on to settle in Iraq. A further 25,000 Armenians arrived in Iraq during the early twentieth century as they fled the persecution of the Armenian Genocide. They established schools, athletic and cultural clubs, and political and religious institutions in urban centers across the breadth of Iraq. During the 1980s, the Armenian community flourished as a result of President Saddam Hussein's modernization efforts, as it continued to rebuild its cultural institutions and even consecrated an imposing cathedral in Baghdad. Saddam retained many Armenians among his personal entourage: his nanny was Iraqi-Armenian, along with one of his body guards, his jeweler, tailor, and housestaff. One of his mistresses was Juliet N. Gurjian. The Armenians benefited under the secularist rule of the Baath party, which strongly suppressed the Islamist forces especially the Shiite Iraqi elements that would later rise against Saddam. The Armenians also did not support anyone in the opposition so the Hussein regime count on their loyalty and consequently grant them many rights. During Christmas, Saddam Hussein would order large amount of flowers to be taken to the Baghdad Armenian church. After the launch of the second Iraqi campaign, more than 3,000 Armenians left the country, head of National Management of Armenians in Iraq Paruyr Hakopian stated. “Four years have passed since the launch of military campaign in Iraq by Coalition forces. And I confirm with certainty that the number of Armenians who have immigrated abroad does not exceed this mark,” he noted. Mr. Hakopian said four years ago there were 18,000 Armenians in Iraq and now only 15,000 of them live in the country. Generally during the past 4 years 1,500 Armenians immigrated to Syria, about 1,000 arrived in Armenia and about 500 departed for Jordan,” he stressed. Many Armenians served in the military during Iraq's eight-year war with Iran and the Persian Gulf War. More than 130 from Zakho (a town with an Armenian population 1,500-strong) were killed in the conflict with Iran while three others, also from Zakho, were killed in coalition air strikes in Kuwait, Basra, and Mosul. Civilian casualties in the aftermath of the Persian Gulf War, following the rebellion by the Kurds, included four Armenian babies who died in fighting near the Turkish border. With the invasion of Iraq, the situation for Armenians in Iraq worsened considerably. Armenians have been subject to killings and kidnappings for ransom. Many Armenians have immigrated to other Middle Eastern countries (most notably Syria and Lebanon), Europe, the US, Canada, and Australia. Armenian churches have also been target of bombings by paramilitary groups. In October 2007, two Armenian women in Iraq were killed by the Australian private security contractors, Unity Resources Group, in Almasbah district in Baghdad. The Armenian winner of the Miss Iraq competition went into hiding out of fear of being targeted by Islamic militants. Armenia took part in the efforts of the US-led Coalition by sending a group of 46 non-military personnel, including 30 truck drivers, 10 bomb detonation experts, three doctors and three officers. They served the under Polish command in the city of Karbala and the nearby town of Hillah. In October 2008, Armenia ended its modest presence in Iraq, citing improved security and the ongoing withdrawal of a much larger Polish army contingent that has supervised Armenian troops deployed in the country. Armenians in Iraq are mostly members of the Armenian Apostolic Church (also known as Armenian Orthodox) or Armenian Catholic Church. St. Gregory the Illuminator Armenian Apostolic Church (at Younis al Sabaawi Square, Baghdad) is the main church for the Armenians of Iraq. There is also the Saint Vartan Armenian Apostolic Church in Dohuk, northern Iraq. Avak Archbishop Asadourian is the Primate of the Armenian Apostolic Diocese in Iraq since April 1980. The Armenian Catholic Archbishopric Church maintains a presence in Baghdad, as does the Armenian Evangelical Church of Baghdad. Some Armenian churches were also targets of bombing and some Armenians have died as a result of sectarian fighting in Iraq. Armenians have played traditionally an important role in Iraqi culture, particularly in literature and music and in general all arts. Armenian folk music and dance is admired in Iraq. Yaacoub Sarkis was a famous author and researcher in Iraqi arts. He used to hold cultural gatherings in Baghdad's Murabba'a region on the Tigris river, where the Iraqi cultural elite would meet. He is also renowned for the two-volume Al Mabaheth al Iraqiyyah, a definitive guide of Iraqi history and society. He lived well into his eighties before his death in the 1950s. The two founding members of the Western-style pop group Unknown to No One, Art Haroutunian and Shant Garabedian, are of Armenian heritage. During Saddam's reign the band could only have its music aired once they sang a song celebrating the dictator's birthday. Unknown to No One has been given a large amount of publicity in the post-Saddam era. Armenian populations in Iraqi Kurdistan have been in the region since the 1920s, after they were displaced in the Armenian Genocide. Their numbers have increased considerably with waves of new immigration coming from Baghdad and other Iraqi regions after the toppling of Saddam. Armenians attribute their leaving towards the north to safety concerns, with some Armenian institutions and churches having been targeted by bombings, and some Armenians subject of kidnapping and killings in Baghdad and central regions of Iraq. 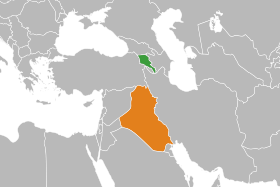 The Armenians consider the Kurdish-dominated parts of Iraq in general to be much safer areas to live in. A Kurdish Government official representing the Armenian community reported to Araratnews in 2011 that Iraqi Kurdistan had 3,600-3,800 Armenians- but this number is likely much higher now due to population displacements due to ISIS and Kurdish annexations of disputed territory. The Armenians of Iraqi Kurdistan have two schools(in Erbil and Dohuk) and five churches (in Dohuk, Erbil, Avzrog, Havresk, Zakho). There is also an Armenian church and congregation of 500 in Kirkuk, a city in a disputed region occupied by Iraqi Kurdistan. The Armenians in Iraqi Kurdistan have one reserved minority seat in the parliament of the Kurdistan Region of Iraq. A notable Armenian village exists in Avzrog, a village in the Iraqi province of Dohuk. There are in fact two Avzrog's: one populated by Armenians, and the other by Assyrians. The name of the village comes from the Kurdish language; av (water) and zrog (yellow). The Armenian one is called Avzrog Miri, while the Assyrian is called Avzrog Shno. The village was built for the first time in 1932 when the Armenians of Zakho and its suburbs decided to establish the village and settle in it. The village was destroyed in 1975 by Saddam Huseein and resettled with Arabs. In 1996, the town was repopulated with Armenians and the Arab tribes who settled in the village were driven out, and later on the local St Vartans church was reconsecrated and built in 2001. Additionally, Although the villagers are Armenian, they don't speak Armenian- they speak Kurdish. Armenians in Avzrog maintain their Armenian social identity like folklore, religion and names nevertheless. Avzrog has a total population of about 350 people. Havresk is an Armenian village founded in 1928 by Armenians fleeing Turkey in the Armenian Genocide. It was a large and prosperous village during the 1950s, having an Artesian aquifer, library, church, and school. However, during the Al-Anfal Campaign it was destroyed and its Armenian residents forcibly evicted. It was rebuilt in 2005, however, and now has a population of 100 families. The village has 115 houses, a greenhouse, a school, and a church that was recently built in 2012. The town's mayor (mukhtar) is Murad Vardanian. The village is located roughly 5 miles southeast of Avzrog in the Plain south of Zakho. A small Armenian populated village of 20 houses was built in the Nineveh plains of Iraq between the cities of Karemlash to the south and Bakhdida in the north. The village was created in order to accommodate Armenian refugees from Baghdad and other areas in Iraq. The village is named after the financier and developer of the village, the Assyrian politician and businessman Sarkis Aghajan Mamendo. ^ "Իրաքում ընդհանուր առմամբ մնացել է շուրջ 10 հազար հայ [Around 10 thousand Armenians remain in Iraq]". News.am (in Armenian). 30 November 2011. Retrieved 27 January 2013. ^ a b c "Armenians of Iraqi Kurdistan – Taking Up Arms Against the Ongoing ISIL Threat - Hetq - News, Articles, Investigations". Retrieved 24 September 2017. ^ Fisher, William B. (1978). The Middle East: A Physical, Social and Regional Geography. London: Routledge. p. 363. ISBN 978-0-416-71520-0. ^ Ashjian, Ara (12 August 2009). "Armenian Issues: From the Armenian Church of Iraq- A visit to the Armenian Community of Kirkuk". Retrieved 24 September 2017. ^ "Iraq: Tiny Ethnic-Armenian Community Survived Hussein, Making It In Postwar Times." RFE/RL. July 6, 2004. ^ a b c Dekmejian, R. Hrair (1997). "The Armenian Diaspora" in The Armenian People from Ancient to Modern Times, Volume II: Foreign Dominion to Statehood: The Fifteenth Century to the Twentieth Century, ed. Richard G. Hovannisian. New York: St. Martin's Press, p. 427. ^ "Crushing Iraq's human mosaic". BBC News. 2007-07-13. Retrieved 2010-04-25. ^ Hovannisian, Richard G. "The Ebb and Flow of the Armenian Minority in the Arab Middle East," Middle East Journal 28 (Winter, 1974), p. 28. ^ Cockburn, Andrew and Patrick Cockburn. Saddam Hussein: An American Obsession. London: Verso, 2002, pp. 5, 160. ^ 28 Armenians died during 4 years in Iraq. PanArmenian.net. March 24, 2007. ^ Fisk, Robert. The Great War for Civilisation: The Conquest of the Middle East. New York: Alfred A. Knopf, 2006, pp. 685-86. ^ Kramer, Andrew E. (2007-10-11). "2 Killed in Shooting Mourned Far Beyond Iraq". The New York Times. Retrieved 2010-04-25. ^ Haynes, Deborah (2007-10-10). "Security firms under attack after women are shot dead". The Times. London. Retrieved 2010-04-25. ^ "Iraq's beauty queen fears for life after threats to pageant." USA Today. April 12, 2006. ^ "Armenia Ends Iraq Mission Archived March 10, 2014, at the Wayback Machine." Asbarez. October 16, 2008. ^ Spencer, William (2000). Iraq: Old Land, New Nation in Conflict. Brookfield, CT: Twenty-First Century Books. p. 38. ISBN 978-0-7613-1356-4. ^ "The Armenian Church - Mother See of Holy Etchmiadzin". www.armenianchurch.org. Retrieved 2017-09-04. ^ Nawa, Fariba. "Iraq's Boy Band Dreams Big." Scholastic News. ^ a b Diplomatic, MED. "MED - Middle East Diplomatic". araratnews.eu. Retrieved 24 September 2017. ^ Hayastan, Kurdistan And (29 October 2008). "Kurdistan and Hayastan - Hand in Hand: Avzrok - Armenian village in southern Kurdistan". Retrieved 24 September 2017. ^ "Avzarook Miri (Armenian)". www.ishtartv.com. Retrieved 24 September 2017. ^ "Hawresk". www.ishtartv.com. Retrieved 24 September 2017. ^ "Aghajanian". www.ishtartv.com. Retrieved 24 September 2017. This page was last edited on 15 February 2019, at 15:47 (UTC).